India will need to feed approximately 394 million more people by 2050, and that's going to be a significant challenge. Nutrient deficiencies are already widespread in India today–30 percent or more are anemic–and many regions are chronically water-stressed. Making matters worse, evidence suggests that monsoons are delivering less rainfall than they used to. But a study published today in Science Advances shares a brighter outlook: replacing some rice with less thirsty crops could dramatically reduce water demand in India, while also improving nutrition. 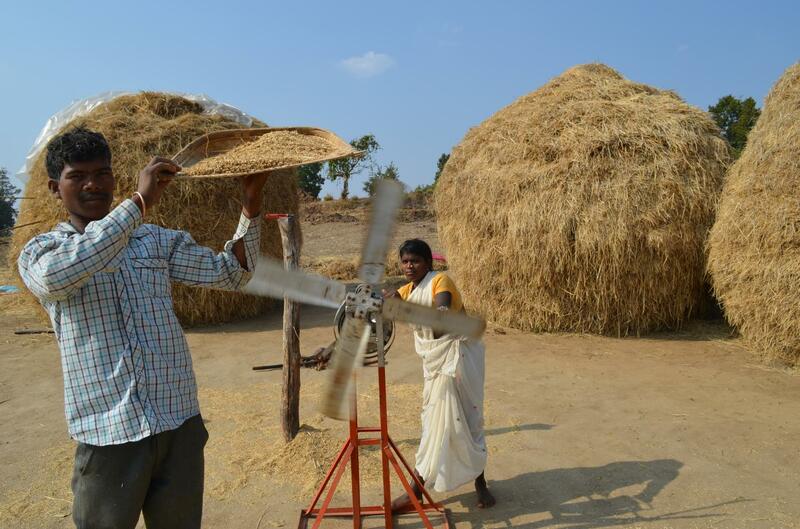 Starting in the 1960s, a boom in rice and wheat production helped reduce hunger throughout India. Unfortunately, this Green Revolution also took a toll on the environment, increasing demands on the water supply, greenhouse gas emissions, and pollution from fertilizer. "If we continue to go the route of rice and wheat, with unsustainable resource use and increasing climate variability, it's unclear how long we could keep that practice up," says Kyle Davis, a fellow at Columbia University's Earth Institute and lead author on the new study. "That's why we're thinking of ways to better align food security and environmental goals." The study addresses two key objectives of the Indian government: to reduce undernourishment and improve nutrition, and to promote sustainable water use. Davis and his colleagues studied six major grains currently grown in India: rice, wheat, maize, sorghum, and pearl and finger millet. For each crop, they compared yield, water use, and nutritional values such as calories, protein, iron, and zinc. They found that rice is the least water-efficient cereal when it comes to producing nutrients, and that wheat has been the main driver in increasing irrigation stresses. The potential benefits of replacing rice with alternative crops varied widely between different regions, depending on how much the crops could rely on rainfall instead of irrigation. But overall, the researchers found that replacing rice with maize, finger millet, pearl millet, or sorghum could reduce irrigation water demand by 33 percent, while improving production of iron by 27 percent and zinc by 13 percent. In some instances, those improvements came with a slight reduction in the number of calories produced, because rice has been bred to have higher yields per unit of land. So in some regions there's a tradeoff between water and land use efficiency, but Davis thinks that with more attention from scientists, the alternative crops could develop higher yields as well. For now, rice replacement isn't a one-size-fits-all solution, but something that should be evaluated on a case-by-case basis for each district, he said. While the findings are promising, the authors stop short of making policy recommendations–yet. First, says Davis, they'd like to add other variables into the analysis, including greenhouse gas emissions, climate sensitivity, and how much labor and money it takes to grow each crop. In addition, the team wants to study Indian food preferences, to see if people would be willing to incorporate more of these alternative cereals into their diets. Davis is hopeful; "There are places around India where these crops continue to be consumed in pretty large amounts," he says, "and there were even more a generation or two ago, so it's still within the cultural memory." India's state-run Public Distribution System (PDS) could be an ally in influencing consumer preferences. PDS currently subsidizes rice and wheat to support smallholder farmers and low-income households. Those subsidies have given incentives to farmers and consumers to plant and buy those crops, but future policies could help to encourage the use of the more nutritious, water-saving cereals like millet and sorghum. "If the government is able to get people more interested in eating millets, the production will organically respond to that," says Davis. "If you have more demand, then people will pay a better price for it, and farmers will be more willing to plant it." Kyle Davis is also a NatureNet Science Fellow with the Nature Conservancy. Other authors on the study include: Davide Danilo Chiarelli and Maria Cristina Rulli from Politecnico di Milano in Italy; Ashwini Chhatre from the Indian School of Business; Brian Richter from Sustainable Waters; Deepti Singh from Columbia University and Washington State University; and Ruth DeFries from Columbia University.